Thoroughbred mare with foal. Photo by Jennifer MacNeill / jmacneillphotography.com (all rights reserved; used by permission). 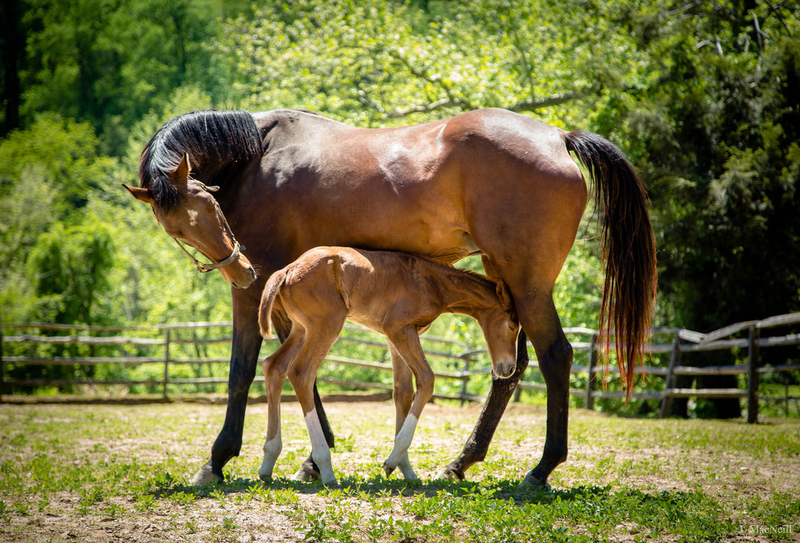 Thoroughbred mare with foal; [file:field-file-main-description] Photo by [file:field-file-photographer]/[file:field-file-source] ([file:field-file-license]). The thoroughbred is a breed of horse celebrated for speed and endurance. Thoroughbreds are best known as racehorses, but are also popular in other equestrian sports such as polo, hunting, and eventing. Thoroughbreds are also used in police work, equine-assisted therapy, and vocational training in correctional facilities. All thoroughbreds trace their lineage to three stallions brought to Great Britain from the Middle East over three-hundred years ago. Known as the “Foundation Stallions,” they are the Byerly Turk, the Darley Arabian, and the Godolphin Arabian. They were bred to native horses to produce a breed that could sustain speed over an extended distance. The thoroughbred has been selectively bred for these qualities ever since. American thoroughbred pedigrees are documented in the "American Stud Book," first compiled by Colonel Sanders Bruce of Kentucky in 1873. 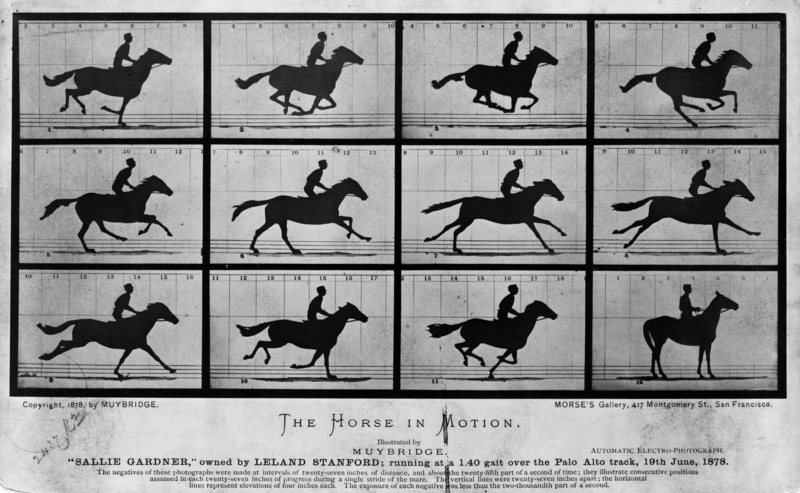 "The Horse in Motion" by noted photographer Eadweard Muybridge (the photos for this composition were taken in 1878 - they show that there is a moment mid-stride when racing horses have all four hooves off the ground). Public domain image on Wikipedia (provided directly by Library of Congress Prints and Photographs Division). Galloping thoroughbred race horse (animated in 2006 using photos taken by Eadweard Muybridge for his "Human and Animal Locomotion" series published in 1887); public domain image on Wikipedia. 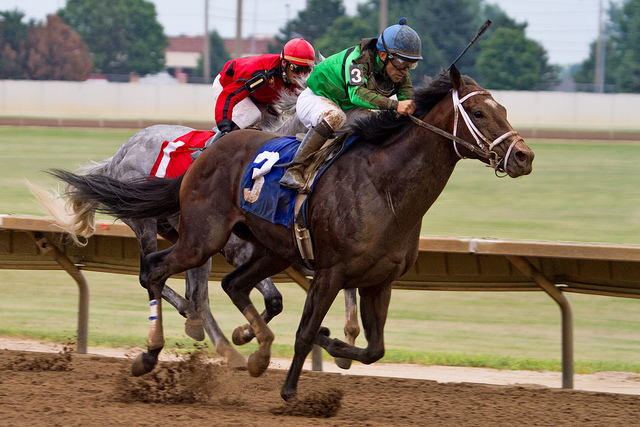 Racing thoroughbred horses; photo by Jason Mrachina on Flickr (noncommercial use permitted with attribution / no derivative works).